Summary reports allow you to see a quick snapshot of different aspects of your business. They group your data by different criteria you set. In a nutshell, A Summary report allows you to summarize your report results. If you would like to create your own summary report, start by naming your report and adding filters, according to the main report creation process, then under the Preview, select a Summary Report, instead of a Tabular one. Click Show to choose whether you want to display record counts and/or details. Selecting a summary report will allow you to drag fields (from the right side of your screen) by which you want to group the report. You can use the same fields and drag them as columns onto your report. When your field will create a group, you will see a green highlight onto the area where the group will be display. When the field will add a column, you will see a black line that shows the position of the new column. If you choose to only show record counts (Show button > uncheck Details), you will need to drag your fields onto the report in order to create it. For instance, if we want to see a snapshot of account balances, according to the filters we have set, we would simply drag the Balance field onto the report. It would then look similar to the screenshot below. The report will simply count the records according to the field you select. Another example would be the Account Type field, which would break down your accounts and display how many customer or prospect accounts there are in your system, for instance. The difference between showing record counts and details is that the Record Count will only show how many records are the same (e.g. : account type is customer); while a Record Count and Details report will also show the list of records, not only the count. You can use the same process to add as many grouping fields as you need. Each field will create a group of records according to the values they return. For instance, if we set Account Type and Balance as grouping fields, the report will display grand totals for each field we have selected. If we have selected to show details as well, it will display the records according to the narrowest field. 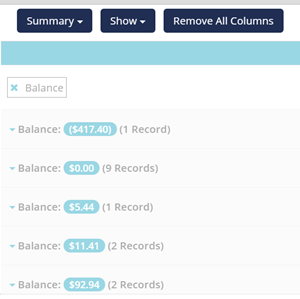 In the screenshot below, for example, the Account type field is broader than the Balance field, which determines that the report displays the Account Type first, as a grand total, then to break it down by balances (with grand totals for the different balance values). When you are happy with your report, you can run it immediately or save it for future use. Click the arrow next to the Run button and select Save and Run, to do both at the same time.